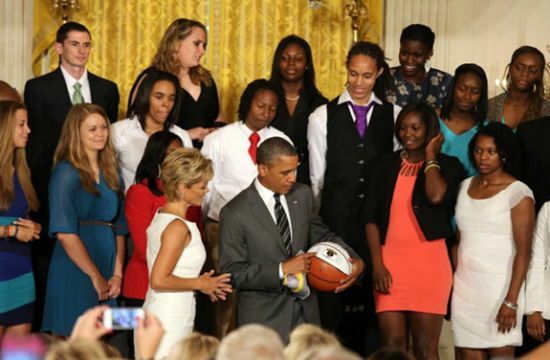 WASHINGTON – Baylor University undefeated women’s basketball team and NCAA champions celebrated their achievements at the White House last Wednesday. President Barack Obama congratulated the team on scoring more points than any team in women’s college basketball history and recognized the players for their contributions both on the court and in the community. The girls were honored for academic achievements as well as their volunteer work, reading to elementary school students, serving the homeless and other humanitarian work in Kenya. Obama singled out center and Aldine ISD alumni Brittney Griner. Griner, a three-time All-American, was recently named Female Athlete of the Year by ESPN. Obama also commended Lady Bears Coach Kim Mulkey and the team’s seniors for being role models for his two young daughters and girls everywhere. He noted that the Bears were a shoe-in to be a favorite on his bracket next year. Chicken Club is an anti-drug program in the Aldine schools, aimed at the fourth grade level student. It is a project supported by the school district and the Aldine Noon Optimist Club. The Aldine program was started about 10 years ago, and involves about 5000 fourth grade students in the AISD schools every year. The outstanding feature of the program is a yellow tee-shirt each student gets, proclaiming their desire to avoid drugs. This works because it relies on “reverse peer pressure,” according to Optimist president Steve Mead. With the retirement last year of long-time program coordinator Clarence Johnson, this responsibility has been assumed by AISD Assistant Superintendent for Administration Ken Knippel. Knippel was on hand at last week’s Optimist’s luncheon, to thank the club for their support and assure them he will continue the program with enthusiasm and help from his counselor staff at each school. Knippel has been with Aldine ISD all his 26 year career, first as a teacher and coach, then 7 years as an assistant principal and 13 years as a principal. N – Not interested in Drugs. All of these values are part of the commitment that the fourth graders make when they join the program. The anti-drug program is similar to the DARE (Drug Abuse Resistance Education) program offered to fifth graders. The club was founded by the Optimist Club in Phoenix, Ariz., and tailored for use in Texas districts by the La Marque Independent School District. The Aldine Optimist Club was instrumental in bringing the program to the schools and has been an active supporter since its inception. With former Precinct 1 Constable Jack Abercia out of the picture and facing federal corruption charges, candidates Alan Rosen and Cindy Vara-Leija will square off in the upcoming primary run-off with the task of restoring integrity to the office if elected in November. 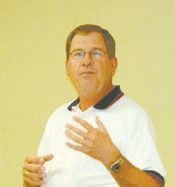 After a close race in the May primary election, both candidates are gearing up for an even closer run-off election which will take place July 31. The May primary saw six democratic candidates compete to face the only Republican candidate, Joe Danna, in the November general election. Vara-Leija received 23.78 percent of the total with 3,512 votes, trailing Rosen who received 27.96 percent of the total with 4,130 votes. “This is an election that’s going to be decided on very few votes  probably less than a hundred,” Vara-Leija said. Constables office with ethics training for the entire staff, and a similar need to end the culture of pressure and intimidation that ran rampant under the Abercia era. Rosen and Vara-Leija have gathered strong endorsements for the position with Vara-Leija gaining support from the Houston Chronicle among others, and Rosen from three of the four other Precinct 1 Constable candidates among others. Rosen has 21 years of law enforcement experience and is currently a major and commander of the Special Operations Bureau in the Harris County Sheriffs Office. Out of those 21 years, Rosen has spent 12 years working in the Constables office, with four of those years spent in Precinct 1. He has a degree in Criminal Justice from the University of Houston. If elected, Rosen said one of his main focuses will be implementing a “stringent code of ethics” and providing training in multiple areas for the entire staff. Rosen said he plans to hold a public forum every quarter and send out newsletters to encourage transparency within the Constable’s office. His other areas plans include integrating the Houston Police Department and Constable’s office radio systems and bringing the Constables office up to date technologically. To deal with budget constraints, Rosen said he will recruiting and utilizing peace officers to expand the workforce and increase law-enforcement presence at zero cost. Rosen himself has drawn criticism himself for not explicitly disclosing that he works as a reserve officer and that he has spent the majority of his career as a reserve, although Rosen said this is only indicative of his dedication. As an “outsider,” as he refers to himself, Rosen said he will use his experience at the Sheriffs office to “bring fresh ideas” to the Constable’s office. Vara-Leija said one of her main priorities if elected Constable would be to reassess and restructure the department to see where employees fit the best need, particularly in light of tighter budgets. Having worked in the Constables office for more than 28 years, Vara-Leija emphasized her experience as vital to the role of Constable. Vara-Leija, who is currently retired, started as a deputy in Precinct 1 before becoming a sergeant, and later being promoted to Captain. Her other points of focus would include creating a citizen’s advisory council to bolster communication between the community and the Constables office, increasing collaboration between different law enforcement agencies, and hiring more diverse, qualified employees to reflect the Precinct 1 population. Although her tenure under Abercia has drawn criticism from weary voters, Vara-Leija, who retired months before Abercia stepped down, said she was never privy to any of the conversations revolving the alleged abuses under the former Constable. Early voting begins on Monday, July 23. 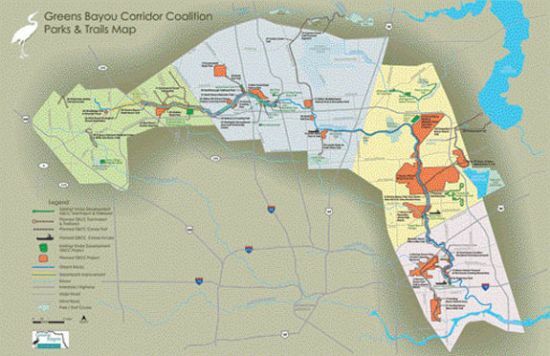 NORTHEAST  Jill Boullion, Executive Director of the Greens Bayou Corridor Coalition, has released the final report on plans for parks and Trails along the full length of the Bayou. Residents of the Aldine and North Forest areas, as well as most of the North Houston/Greenspoint neighborhoods, will benefit from a myriad of parks and recreational features that will be built along the bayou, according to Boullion, who spoke at a recent East Aldine District luncheon. However, she emphasized that this plan must be implemented with funding that has not yet been achieved in many of the cases. The Master Plan is a joint partnership of the Coalition, and the National Park Service. Goals and objectives of the Master Plan are Conservation, Developed Parks & Recreation, Connectivity, Landscaping, and Sustainability, according to the plan document. 2. Lauder Basin Park and Trails, A 100+ acre wooded site, suitable for recreational improvements for sports, trails and more. 3. Glen Forest Basin Nature Park, a 165 acre HCFCD flood detention basin currently under construction. 9. Aldine Westfield Basin Natural Area and Recreation Park, a HCFCD flood detention basin of 110 acres. 12. Kuykendahl Basin Park, a 300 acre detention basin suitable for recreation and a trail linked to the main bayou. 13. Cypress Creek Trail Foxwood Segment, a greenway trail with a missing 2 mile segment. 14. Greens Crossing Park, an 8 acre wooded site near Gears Loop and West Greens Road, owned by Greenspoint District, could be developed with trails and quiet areas. 20. Hollister Basin Park, 213 acre site for HCFCD detention, and trails, recreation, and a dog park. East of Cutten Road. 22. Aldine ISD Greens Bayou Outdoor Learning Center, a wooded 10 acre site good for outdoor learning and environmental stewardship, near 3 schools. 23. North Fork Trail, a 6.5 mile trail along Greens Bayou would provide safe crossing under I-45 and to nearby Spring Skate Park. 25. North Belt Park, 42 acres of wooded property at Aldine Bender and the bayou. 27. Northgate Recreational Area and Community Center, 8 acres between Northchase and Benmar, now a site of a waste water treatment plant that will be abandoned, could include a community room classrooms, a gym, and soccer field. 29. Lauder Basin to Keith Wiess Park Trail, a proposed 1 mile trail. 31. North Reach Extension Trail, 1.5 mile trail from Knobcrest to Gears Road to connect with the Glen Forest detention basin. 32. Beltway 8 Crossing Trail. 33. West hardy Road Trail, from Bradfield Park to West Hardy and then to Ida Gaye Gardens. 35. Northborough Trailhead Park, 17 acres that could be a trailhead park. 1. Greens Thicket Wilderness Park, 1300 acres owned by Harris County Flood Control, possible wilderness park. 4. Greens Bayou Wetland Mitigation Bank Education Program, 1400 acres suitable for educational programs about wetland. 7. Parkway Trail Extension, near Sheldon Reservoir to extend an existing 3.5 mile trail. 8. Greens Bayou Trail from Green River road to North Lake Houston Parkway. 11. Brock Park Expansion along Halls Bayou, expansion of Brock Parks 300 acres to a 600 acre nature park. 18. Carpenters Bayou Nature Trail, from Sheldon Lake State Park to Summerwood, to Lake Houston. 24. Summerwood Trail, a 2.5 mile connecting trail. 39. Upper Sheldon Natural Area & Trail, a 400 acre TPWD scenic area along Carpenters Bayou. Many of the above projects, and the others in the West and South Reach, require further funding and planning to become a reality, but this Master Plan provides a framework for that future set of goals. Jersey Village Detention Basin, West Reach. A 43 acre detention basin along White Oak Bayou. Greens Bayou STEP Trail, North Reach. A two mile concrete trail funded by the Statewide Transportation Enhancement Program. TxDOT will construct the trail. Greenspoint District is providing local matching funds and will maintain the trail. To be completed in 2013, it will extend west of Wussow Park, and east of City View Park. Spring Skate Park/Dylans Park, North Reach. A 25 acre park with 15 acres of passive park and a 65,000 square foot skate park, and a five acre park without limits designed for handicapped users. Between the Kuykendahl Basin and the Glen Forest Natural Area. 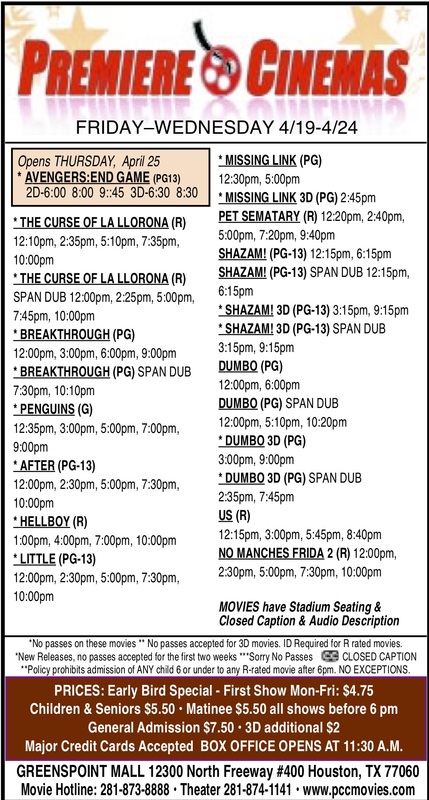 Developed by the Greenspoint Redevelopoment Authority. Ida Gaye Gardens, North Reach. A 3.2 acre park next to the Langwick Senior Community. For the benefit of the health of seniors. With exercise equipment, walking trails, and community gardens. Waste Management Nature Preserve and Garners Bayou Trail, East Reach. A 43 acre tract along Garners Bayou, to include a pond, wetlands, hiking trails, and fitness stations. 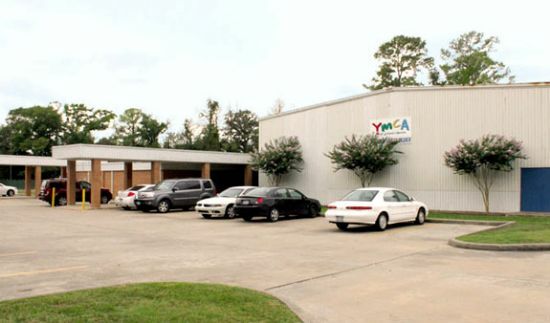 The Aldine-Greenspoint Family YMCA is not your typical YMCA. In fact, it’s not a YMCA in the traditional sense at all. Only one of two of its kind in the Greater Houston area, the Aldine-Greenspoint Y is a “Y without Walls.” Instead of a traditional building, the Aldine Y uses existing facilities throughout the community to run its programs while operating out of one main office storefront. The Aldine-Greenspoint Y maintains relationships with several partners in the area that provide spaces for its numerous programs. These include the East Aldine Management District, the Greenspoint Management District, Lone Star College System and Aldine ISD. The Y has about 1,000 program members and about 175 members who can use any YMCA facility in the city. Day camps, sports programs and other activities are held in parks, Aldine ISD schools, the North Harris Lone Star college campus, the Acres Homes multi-service center, churches, apartment complexes and a number of other sites in the community. 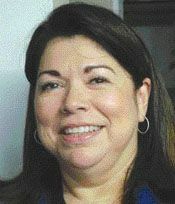 While not having a traditional facility may seem like a disadvantage to some, social responsibility director Claudia Sanchez said that by allowing staffers to build strong relationships in the community, it can actually prove to be a blessing. Despite multiple locations, the Aldine-Greenspoint Y offers essentially all of the same programs as a traditional YMCA, is funded the same as a traditional YMCA and even engenders the same sense of community as a traditional YMCA. Calcote said he hopes that the small communities they build in the area will eventually grow into one large, unified community. But without the visibility of a central location, Calcote says they still face one minor challenge: letting people know they exist.